Car seat technology has certainly come a long way in the past three decades. I have clear memories sitting in the front seat of my mom’s car (and playing with the radio buttons!) at age five — a practice that is now against the law in most states. Today, infants and young children are required to use car seats in all 50 states. And 48 states require booster seats for older children. (The Governors’ Highway Safety Association lists specific laws for each state.) Even though fewer children are dying in car accidents than ever before, vehicle crashes are still the leading cause of death for children ages 1 to 17. So safety experts continue to learn more about how children respond in car crashes, and update the guidelines about how to keep kids safe. The latest recommendation — made in 2011 by the American Academy of Pediatrics — recommends that children sit in rear-facing seats for as long as possible, at least until age 2. The National Highway Traffic Safety Administration also recommends children remain rear-facing as long as they fit the height and weight limitations for their seat. These recommendations are based on a growing body of evidence that finds the neck muscles of young children are not strong enough to protect their spine and spinal cords in a frontal crash. As a result, the force of the crash snaps the child’s head forward, which can lead to broken neck bones and spinal cord injuries. An analysis of U.S. crash data over 15 years found that rear-facing car seats prevented death or serious injuries in 93 percent of crashes, whereas front-facing seats only prevented death or serious injury in 78 percent of crashes. In frontal crashes, rear-facing seats were five times more likely to keep kids safe compared to forward-facing seats. And a review of the evidence in the British Medical Journal found similar evidence, and recommended children remain rear-facing until age four. Many parents worry that leaving an older child rear-facing will lead to leg injuries in a crash because there is not enough leg room between the child restraint and the seat back. There is not a large body of evidence on this topic, but one study found that children in forward-facing seats are more likely to sustain leg injuries when a rear-end crash propels their legs into the seat in front of them. I did all of this research this week because my youngest daughter will be two years old soon, and my husband was wondering about turning her car seat around. But it’s clear to me that she will be safer in a rear-facing seat for the foreseeable future. 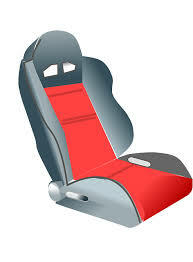 The take-home message: Rear-facing car seats in the backseat are the safest place for young children to ride in a car.